CHRONOMONAUT Has Landed! Now Shipping! CHRONOMONAUT Concept Album Release October 2018! Mostly Live In Italy is Shipping Now! GH LIVE IN CHATTANOOGA Saturday Night May 6th. GH Hi-Res Audio on Bandcamp Now! VALKYRIE Release September 27th, 2016! Babb, Schendel, Shikoh and Raulston hard at work on a new concept album. Stay tuned! DON’T MISS THE SHOW! DOUBLE LIVE IS SHIPPING NOW! “The Breaking Of The World” Is Shipping Now! The Lay Of Lirazel trade paperback! 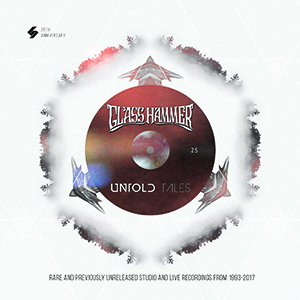 25th Anniversary Special Edition includes rare and previously unreleased studio and live tracks spanning the history of Glass Hammer. Featuring vocalists Susie, Jon, Walter and Carl. Includes “No Man’s Land Live”, two unreleased covers of Argent and Beatles tracks and much, much more. 74 minute running time! Buy Now! Order your copy now at the Glass Hammer Store!